Two WiiWare releases already confirmed for a Monday release. Two more WiiWare releases coming! Bernd Geiblinger has confirmed via the Bplus Forums that their newest WiiWare release Bit Boy!! is coming to the North American WiiWare service on Monday, July 13th. Also confirmed for release by IGN this Monday is Telltales's Tales of Monkey Island EP 1: Launch of the Screaming Narwhal WiiWare title. You can check out our Bit Boy!! review for our thoughts on the game and we'll have a full review of Tales of Monkey Island EP 1: Launch of the Screaming Narwhal early next week. EDIT: The IGN release date for Tales of Monkey Island was incorrect. We apologize for any inconvenience this might have caused. Can't wait to see how the first new Monkey Island in so long pans out. thats cool. i might give bit boy a chance. It's about time!! Now Nintendo, release Super Smash Bros. tomorrow, and this will be a perfect update! 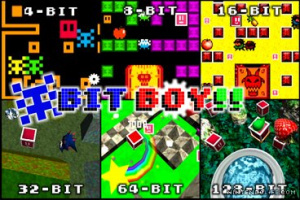 No Cave Story, but Bit Boy!!? The way it's looking, Cave Story will likely be a mid-late August release. Launch of The Screaming Narwhal- Greatest episode title ever or THE greatest episode tile ever. While I've been told that Monkey Island was a fantastic PC game, I'm not interested. Hopefully the VC has SOMETHING to please me, because Bit Boy!! doesn't interest me either. Anyone know the point price for these Monkey Island episodes? @Kidpit: It gets better. Just wait until "The Trial And Execution Of Guybrush Threepwood"! @warioswoods: Likely 1000 per episode, like SBCG4AP. YES! Monkey Island! The new series to a series I've always wanted to play! Not interested, after reading some reviews and watching some videos, now I know I'm not interested in BitBoy!, it doesn't look THAT bad, but not that good either, I'd rather give Niki RnB a try. And about Tales of Monkey Island, it has never been my cup of tea, but I'm glad Telltales is still supporting wiiware with good games. I'll probably wait until I pick up the Monkey Island remake over at XBLA this Wednesday before I dip my points into Tales. Well hopefully Bit Boy!! will be well received here but judging from some of the reviews, I'll be hesitant to fork over the points for it. I really hope Cave Story gets release soon. It's hard saving my Wii Points for that game yet having no idea of a solid date. Oh boy Bit boy! The game that scored a 5/10. Can't wait. NOT! Oh and some monkey game too. Yippie! Let me guess. This weeks VC game will be some peice of crap nobody remembers or cares about. I predict SSB for Monday, 8/31. Why? Because its the day after my birthday and the first day of college so I would be unable to download and play it. Which I wouldn't anyway cuz I have it on N64. Plot twist! Where did you see Tales of Monkey Island confirmed? You should list the source for this information. Release NyxQuest tommorow, and I'll be happy. What do you think is the third wiiware game? IGN listed Tales of Monkey Island as coming on Monday. Sorry. I'm not too big on the idea of $10 for a fairly short "episode" of a game. Any other wiiware games possibly coming out? I'd like to see some japanese wiiware games brought here like escape virus, overturn, or even poles big adventure. @toddr: Next time, see the prediction threads on the forum. But I'll just tell you. I'm predicting it's either Arkanoid Plus, Incoming, 5 Spots Party, Carnival King or Ant Nation. I might even add NyxQuest to that list but the others seem more likely. Who knows. Ah wait a sec here. Tales of Monkey Island is confirmed via IGN date guessing? While I do think theres a good enough chance, that's not exactly too reliable. I remember a few instances last summer where they had a lot of upcoming WiiWare games with the next Monday's date stamped on it and more often then not it turned out to be wrong. Besides, wouldn't Telltale tell us ahead of time like they did with Strong Bad? I don't make up the news, I just report it. Truth is, we've had confirmations directly from developers and publishers that changed at the last minute, so I don't believe it until I see them on the Wii Shop channel. I really hope it's Arkanoid Plus. It had better be 600 points if it does come out, cause that's all I've got for some time. We'll know for sure in just a few hours. @Toddr: I'm sure it will be that very price. But honestly, the other titles I mentioned seem more likely especially given we just got Bust-A-Move Plus. @TwilightV: What time would that be? It's 11:57PM over here. At the end of the trailer, I'm pretty sure it says available July 7th, which has already passed. Interesting that Monkey Island is out so soon. I only heard about this game a week or two ago and suddenly it's hitting the shops... thats a surprise. @KnucklesSonic8: Nintendo Channel will likely update in a few hours. @Toddr: That was the PC release date. WiiWare is confirmed for release shortly after. So in other news, nothing for me. Meh. forget SSB, I want pulseman. I'll actually be more upset if we get SSB 1st. I want a classic game I've actually never played before. There is likely to be one more wiiware to round this out. Maybe NyxQuest or Driift Mania? Brain Challenge is coming tomorrow for dsiware btw. @TwilightV: kk, I was just wondering what time the Nintendo Channel updates (i.e., how far in advance it goes ahead of the Press Release). @KnucklesSonic8: I think it's usually between 1-5 AM. Sure thing. Looking forward to your post about it on the forum. Can always count on you for that. What I'm wondering though, is if Bit Boy will be 100 Points cheaper for us here and instead be priced at 500. Would be interesting. The approx time when the Nintendo Channel SECRETLY updates on Sunday Nights is like 3-4 AM Central. I know I'm late to the party here, but I just wanted to tip my hat to Chicken Brutus for the (intentional!) stealth firstie! Well played, Chicken. EDIT: I'll probably get BitBoy and wait on the Monkey Island review - I haven't paid any attention to that game so far. Now Nintendo, release Super Smash Bros and everything will be OK.
@Wariofan. Game Informer.com said it was coming out this week too, so that's 2 sources saying it'll come out tomorrow. I couldn't find where it said it was coming out on 7/13 at Game Informer. Even so, I'd wager it was a guess like IGN. Even if it does end up being right, I'm willing to be they were still guesses. It does, but it SECRETLY updates on Sunday Nights sometimes with whatever WiiWare and sometimes DSiWare are going to come out a few hours before the PR comes out. I could have sworn the Cave-Story-mid-August thing has been well known for forever and a half now...yet every week someone publicly sighs. Oh and some monkey game too. Yippie! ^ LOL, was thinking the same thing. To the uninitiated, it's a comedy pirate game, not a game about Monkeys. Also, the subhead for this article is "Two WiiWare releases already confirmed", but I cannot see anything on IGN confirming (or even mentioning) Monkey Island episode 1 as being out tomorrow. Is there a link to what is likely just IGN speculation? Anyway I've finished teh PC version of Tales of Monkey Island (ep 1) and it is brilliant. And it's basically identical to the Wiiware version, though I guess the Wiiware one will be much more compressed (textures, audio) to fit the SD card outdated 40MB size limit. It's on the main Wii page. Look under "OUT NOW"
I can't believe the hate on Monkey Island, it's such an awesome series! Can NOT wait for Monkey Island, for once I don't care what comes out on VC this week! Well, Ant Nation is showing up on the Nintendo Channel. So I guess we know what three games are coming out. It also says Wii Sports Resort is coming July 13th. The PC version of Tales of Monkey Island was great. But the controls weren't that great. But I'm curious how it controls on the Wii. Is Monkey Island a point and click game, like Strong Bad? I am looking forward to this game, but I still dislike the idea of 5 episodes for 1,000pts each and over 300 blocks each. MONKEY ISLAND - Hopefully very soon in Europe too!!! 3 WiiWare games and NONE of them are Monkey Island. Yep, sorry about that. I probably should take that with a grain of salt. It's ok Corbs, next week you may need a headline like "Nintendo could be thinking about maybe considering the possibility of releasing Monkey Island this week or sometime in the future"
No Monkey Island. Some one made a mistake. @Charlie The Unicorn - Tales of Monkey Island is an adventure, but not really point-and-click. In the PC version you have to click on items to interact with, but walking is with the keyboard (or a really stupid mouse interface). Different from Strong Bad, Sam & Max and Wallace & Gromit is that the 5 episodes will be one big story instead of standalone episodes. Monkey Island 1-3 was a Point and Click Adventure.